Community has helped shape the creative processes of our collective craft history. Craft forms are passed from generation to generation in necessity and survival, but also in the spirit of community and commonality. This educational guide delves into the rich community of craft in order to provide educators with material that will relate to and reflect the core ideas, artists, and art forms presented in the COMMUNITY episode. Craft forms known to us to today would not exist if it were not for the artists. For thousands of years they have carried on traditions; some remain true to long established practice while others add their own twist. 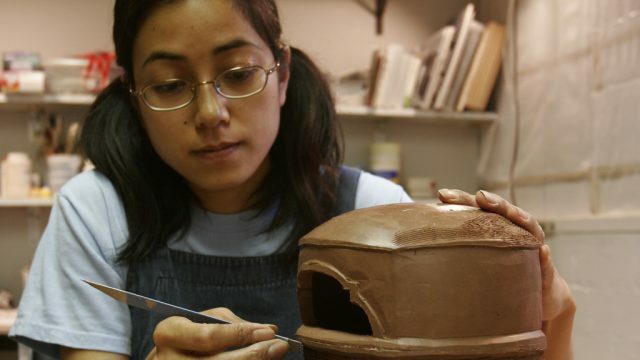 In this section of Education Guide: Community, students will learn that artists such as Mary Jackson and instructors at craft schools like Penland School of Crafts have an innate desire to share what they have learned. Artists and schools like these function with the understanding that in order for craft traditions to exist in the future, they must share what they know. They must teach others. People are interacting all the time and learning from each other. The people that are accomplished learn from the people that want to be accomplished and vise versa. We are all part of a community of learners. From reciting our ABCs to throwing a baseball and learning how to drive, we are constantly being taught by someone how to do something. The things we are taught can be, and often are, simple and practical; yet as we move through life, those simple and practical lessons learned help shape and define who we are. Think back–can you calculate the number of things you have been taught from others throughout the course of your life? Sometimes we do remember who taught us how to read, throw or drive. However, there are so many things we have learned along the way that we often cannot remember who taught them to us. Yet somehow, someone did teach us, and we learned things because someone took the time to show us. Undeniably, there are many types of teachers and diverse contexts in which we learn. Our first and often most important teachers are, of course, our parents, siblings, and families. 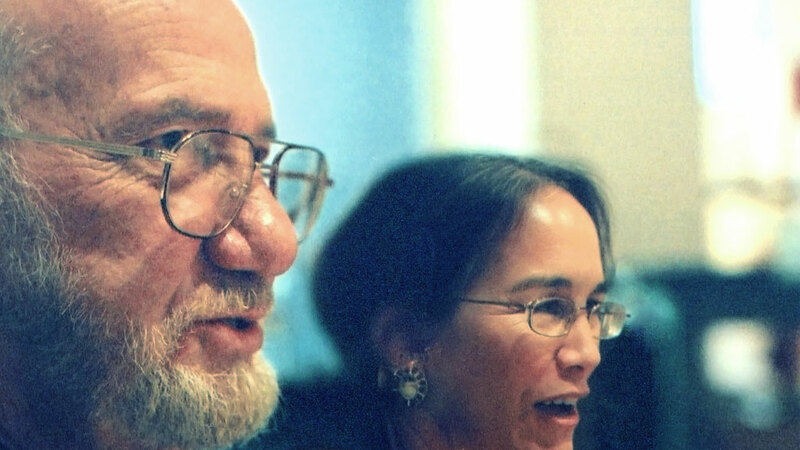 The magnitude of what we learn from them is incalculable and has a profound, ongoing impact on our lives. The most recognizable teachers are the ones who teach within the formal education system in classrooms across the nation. Every day, they work to help expand their students’ knowledge and understanding of defined areas of content to help build an educated citizenry. There are the coaches, program leaders and instructors in various settings throughout the community who teach us how to swim, tie knots, and play guitar, each one a specialist willing to share his or her knowledge and experience with others. Additionally, for better or worse, we are taught informally by our friends, the World Wide Web, television, books, magazines, incidents in the school yard, and ourselves. In the world of craft, teaching takes on many forms and can occur in communities or be initiated by individuals. Regardless of how the craft is taught, what is important is that the craft artists pass on knowledge, skills, and traditions. They want others to learn, to carry on the tradition. And thus, the tradition continues. This is the way it has been for generations, for centuries, for thousands of years. While some artists prefer to work on their own, at Penland there is a genuine interest and enthusiasm for collaboration, for teaching and learning from one another. There is also a profound understanding of both the effect the work has on the maker and the objects produced. 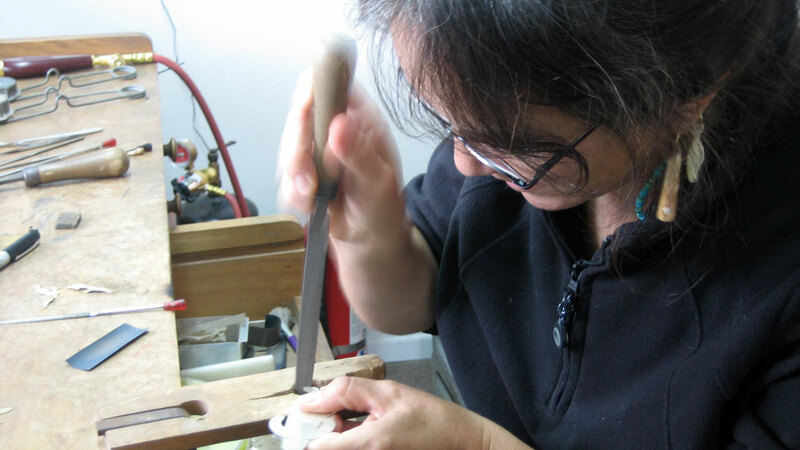 The school is at its base a community of craftspeople teaching, supporting, and encouraging each other. Experiences there can be, in a quiet yet profound way, life-changing; most importantly, each artist learns the value of teaching others. As children, we are taught many things by our parent and families. Sometimes we are ready and willing to learn what is being taught; other times, we resist. Why we resist some things and not others is often hard to determine. 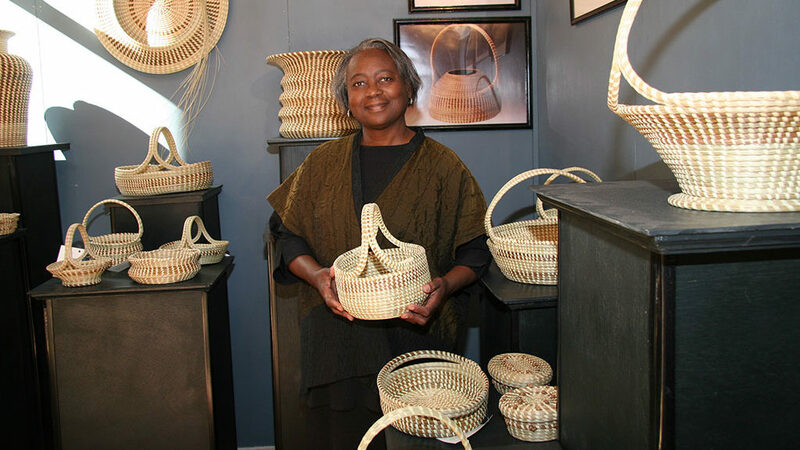 For African-American weaver Mary Jackson, basket making was a summertime family tradition. When she was a child, her whole family would gather following chores to make bulrush and sweetgrass baskets. Her parents would teach her basic traditional designs and techniques. But, despite their efforts, Jackson did not take to weaving. It was not until later in life that she returned to the basketmaking traditions of her childhood and began to fully understand the personal historical significance of the craft. With a sick son at home, Jackson returned to making baskets and was overwhelmed by the response to her work. She soon realized that she could draw on the rich tradition that her people had preserved for over 300 years. Jackson now understands the importance of teaching this traditional art form; she has committed herself to making baskets and teaching the craft to her children and grandchildren to ensure that they carry on this tradition, so deeply rooted in their ancestry. From mother to daughter to granddaughter, each woven basket carries the signature of multiple generations. Jackson takes pride in teaching her family, in passing on her knowledge by showing them the ways of the past and present so they can develop their own signatures. Craft forms known to us to today would not exist if it were not for the artists. For thousands of years they have carried on traditions; some remain true to long established practice, while others add their own twist. In both instances, artists understand their materials, are masters of their techniques, and have developed unique visions in order to make beautiful objects. But all artists take things a step further when they are willing to teach others what they know. Craft artists such as those at Penland School of Crafts and Mary Jackson have an innate desire to share what they have learned, understanding that sharing is necessary if craft traditions are to endure. Teaching allows them to give back what was given to them when they were starting out. This, ultimately, is what makes the world of craft truly unique. Have students come to class prepared to teach another student something they know how to do. For example, one student might teach another how to throw a football, fold an origami crane, knit, do a card trick, play hacky sack, juggle, use a camera, pound a nail, etc. The skill taught should be fairly simple; each student should be able to teach his skill in five minutes or less. Randomly pair students and allow ten minutes total (five minutes each) for your students to teach their skills to one another. When they are finished, have them complete the learner and teacher sections of the Show Me worksheet (Community: Show Me Worksheet #1). Engage students in a conversation about how people learn, where learning takes place, and what things are easy to learn and hard learn. Ask: Why are some things easier to learn than others? How did you learn and master what you just taught your classmate? Help students understand that there many ways to learn and many contexts for learning. For example, school is a formal context for learning; family members showing other family members or friends would be informal. Craft artists learn their art forms in different ways. View the DVD segments featuring Mary Jackson and Penland School of Crafts or online at www.craftinamerica.org/shorts/mary-jackson-segment and www.craftinamerica.org/resources/penland-school-of-crafts. Have students watch for different contexts in which people are learning. After viewing, discuss the segments. Who were the teachers? Who were the learners? Have you ever wanted to learn something and sought out a special class, school or camp? How was that experience like what you saw happening at Penland? Have you ever learned something from a family member, something that has been passed down, such as woodworking, sewing, making preserves? How did that person learn how to it? Discuss why this makes the world of craft so unique and how teaching within families (Jackson) or a particular culture or community (Penland) has kept craft traditions going for thousands of years. 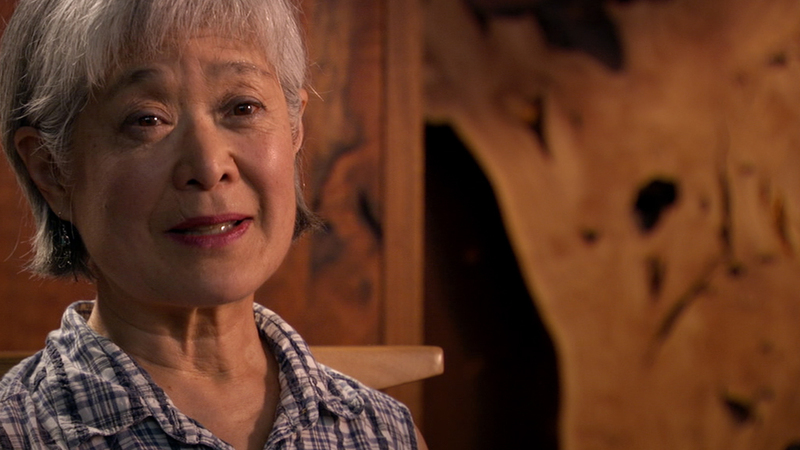 View additional DVD and web segments on Penland School of Crafts and Mary Jackson. Examine DVD or web segments for other artists and art forms that explore the theme Show Me. How do these artists teach their art forms? Compare and contrast Mira Nakashima (wood/LANDSCAPE) and Denise Wallace (jewelry/COMMUNITY) with Penland School of Crafts and Mary Jackson. Who is teaching whom? Working individually or in pairs, have students investigate the history of Gullah baskets using the Investigating Gullah Baskets worksheet (Community: Show Me Worksheet #2). Then, as a group, have students create a visual timeline depicting changes to Gullah baskets over time. Students can include their own sketches, images they found during their research, interesting facts, samples of materials, images about the process, etc. In small groups, have students do a Web search to find out more about craft schools. Possible schools to investigate include Rhode Island School of Design, California College of the Arts, Cranbrook Academy of Art, Rochester Institute of Technology School for American Crafts, Black Mountain College, and Penland School of Crafts. Ask them to consider these questions as they search: How and why did each school evolve? How are various craft forms taught–in workshops, by guest artists, through individual instruction, etc.? Then, engage students in a class discussion about what they discovered. What do all these schools have in common? What makes each one unique? Using the Craft in America Web site and other resources, have students investigate the history of selected craft forms (clay, metal, wood, fiber, and glass). Have them answer the question: How have the traditions and techniques used by craft artists within each art form been passed down? Have them look at other artists, including Sam Maloof and Tom Joyce, to see how each teaches others. When their research is complete, have students create PowerPoint® presentations on the art forms studied. Certain cultures are known for their mastery and understanding of particular craft forms: Wasco or Gullah basketry, Persian rug making, African textiles and wood carving, and Mexican weaving are just a few examples. Have students choose a cultural craft tradition to investigate. Questions to guide their investigation might include: What are the origins of this craft? Why is it specific to this one culture or region? How has it changed over time? How has the tradition been carried on from one generation to the next? When students have completed their research, have them create a PowerPoint® presentation about the various traditions. As students work on their presentations, display a large world map in the classroom where they can indicate with images where each art form or tradition investigated comes from and how these traditions, in some cases, have made their way to other countries. Link all of the presentations together to create a loop; make this part of a display during a public event such as the school fine arts show. Display the map with the PowerPoint® presentation. Have students show others some of the craft traditions represented, and emphasize the importance of teaching one another. Using pre-made paper have students make a concertina (accordion) book using as a place for reflecting on what they have learned. Have them illustrate and write about the craft form or cultural tradition each investigated in the Origins and Traditions activity. They should reflect on what they have learned, making the book into a visual record of the craft’s origin or tradition. The books can be embellished with images, fragments, photos, text, and other materials to create a visual journal. Where is craft taught in your community? Have students look at various schools, fairs, living history museums, church bazaars, and youth organizations (e.g., Scouts, 4-H, etc.). Who teaches craft in your community? Invite local craftspeople to speak to students about how they learned their art forms and where the traditions started. Take the information gathered, and have students create a resource list that can be made available to other students and community members. Ask the local Chamber of Commerce to post the list on their Web site.